Alter Reality Games's latest Invitational event was held August 11-13, 2017 and brought in dozens of players from across the country who earned their invite from placing at ARG Circuit Series events this year. 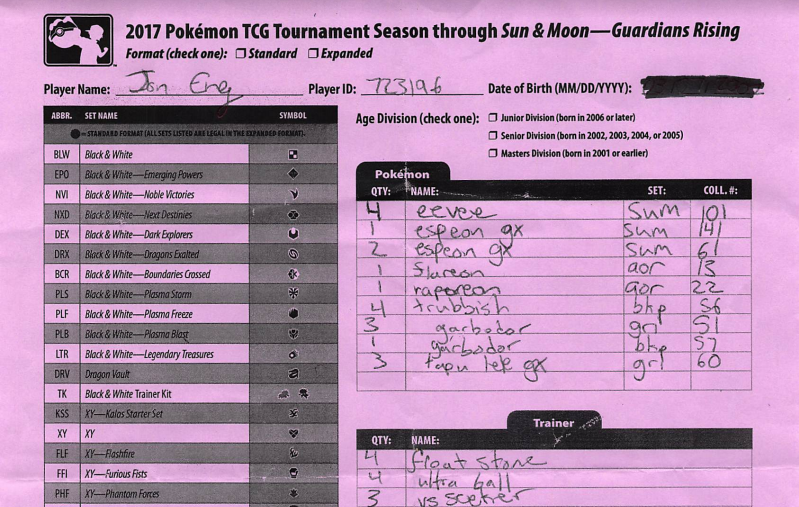 Some of the game's biggest names, like Azul Garcia Griego and Michael Pramawat, were in attendance; in the end, it was Jon Eng who took home the $2000 first-place prize with his Espeon-GX/Garbodor/Eeveelutions deck. "Alot [sic] of the decks were proven from months of testing to be good so people played it safe and picked those. 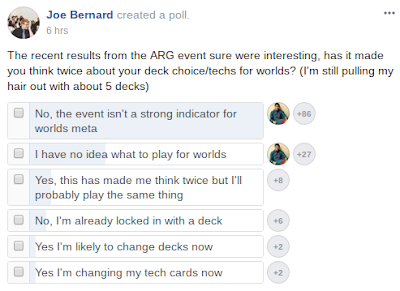 We do not know the best 60 [cards] for the new decks, so they didn't dominate." However, "safe" plays - which would probably be decks like Volcanion or Drampa-GX/Garbodor - actually failed to make much of a splash in the Top 16 cut. 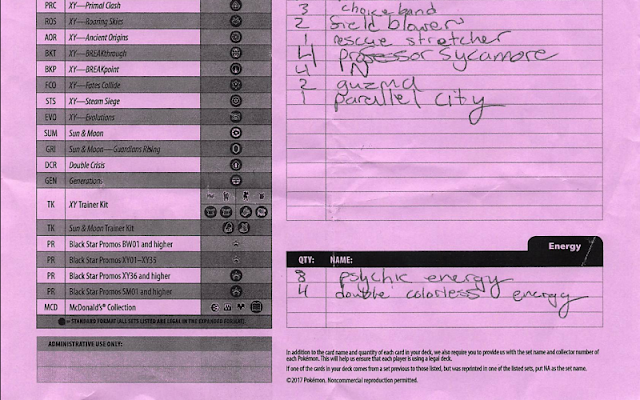 Several of the decks that topped were decks not expected to make an appearance - namely, Espeon-GX/Garbodor (which took 1st and 5th) and Gyarados (which took 4th, 8th, 11th, and 16th!). This leads me to my point: the "play" for Worlds may not simply be the deck that the beats most other decks, but the deck that is able to consistently set up and accomplish exactly what it wants to do game after game after game. Espeon-GX - particularly Eng's winning list - seems like a deck that does this, which is why it's the subject of this article. list can make Espeon-GX deadly. In some ways, I think Rothenbach's point is spot-on: at the time of the Invitatational, PRC-BUS was still an undefined format, and its decks (Gardevoir-GX, Golisopod-GX, etc.) have yet to be refined, except perhaps by the players who have been vigorously preparing them for Worlds. We know that a deck like Drampa-GX/Garbodor can beat almost any other deck under the hand of a skilled player, while new decks like Golisopod haven't had a chance to prove themselves yet, even though they might well be great plays. 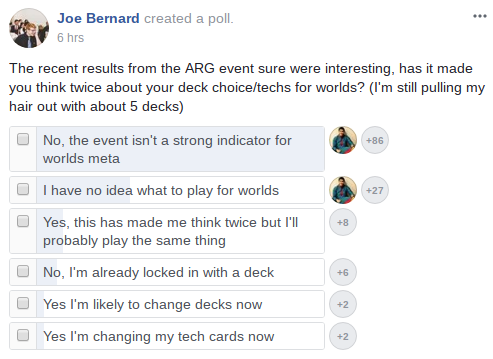 While I concur with HeyFonte's consensus that the Invitational was not a great predictor of the Worlds meta, I do still think some useful information can be gleaned from its results - and these are directly related to how the new BUS cards and decks should be played successfully. So, to attempt to unravel a tiny bit of the enigma that is this year's Worlds, I'm going to look at two of the Top 8 decks from the ARG event: a pair of Espeon-GX/Garbodor variants that took different approaches to deck construction and playstyle. During the last few weeks, most of the discussion around Garbodor decks has focused on the Drampa-GX variant, seen as the stronger build after winning North American Intercontinentals, Liverpool Regionals, and several League Cups, with the Espeon-GX variant largely out of the picture. But Espeon returned with a vengeance at the Invitational, taking two Top 8 spots while Drampa failed to even make Top 16. 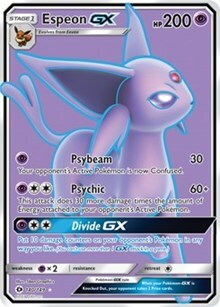 Let's look at the cards used by the two Top 8 lists to see why Espeon was successful. 4-3/1/1 Eeveelutions (Flareon and Vaporeon): Flareon is actually an incredible tech for the deck, enabling its attackers to hit for Weakness against three other popular attackers: Decidueye-GX, Golisopod-GX, and Metagross-GX. Its inclusion is probably one of the reasons Eng was so successful at the tournament, with Decidueye and Golisopod variants taking 5 of the Top 16 spots. Vaporeon was also a great inclusion, as 2nd-place finisher Josh Marking said that Volcanion was one of the most-played decks at the event. The lack of Jolteon to complete the trio is not surprising; the only Lightning-weak Pokemon currently relevant is M Rayquaza-EX, which Eng correctly assumed would not be played enough to warrant a counter card. The thing that actually strikes me most about this list is how straightforward it is. There are no tech Pokemon like Sudowoodo or Giratina; there are no tech Trainers. One Parallel City serves as a general-use counter card, but that's it. It's just a consistent list with good matchups, with the combination of Confusion, type-changing to hit for Weakness, and of course Trashalanche serving to send Jon into first place. One other thing to note is the lack of Lysandre, in favor of two Guzma. Despite the fact that Espeon/Garbodor was not really expected at the event (something Marking himself admitted on Facebook), this deck was absolutely a "safe" play. 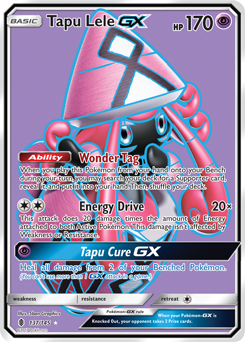 It's consistent, with 4 each of Lele, Sycamore, and N, and it is able to beat most of the metagame if played correctly. Upon close inspection, you'll realize that this list is actually quite different from Jon's. It's a far more teched-out list, with abnormal inclusions like 1 Trubbish GRI, a Pokemon Center Lady, and a Professor Kukui. Also note the lack of Vaporeon, the loss of 1 N for a Brigette, the 1/1 split of Lysandre and Guzma, and only 2 Tapu Lele-GX. 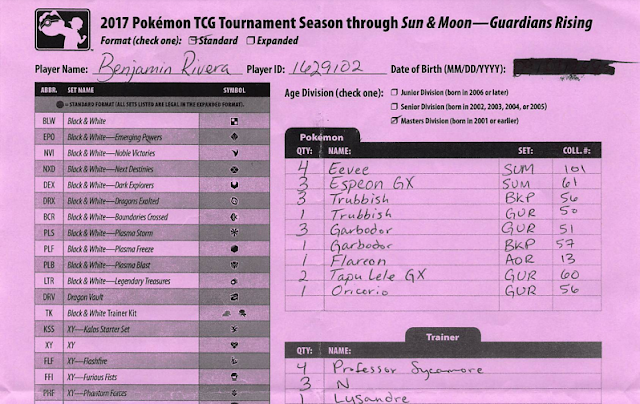 Finally, Rivera chose to play Oricorio GRI 55 as his tech Pokemon, apparently assuming Vespiquen would be a larger force at the tournament than it turned out to be. This is a really interesting list and I give Rivera lots of credit for developing it - while I can't immediately see the value of cards like Trubbish GRI or Pokemon Center Lady, it's clear a lot of thought went into their inclusion. At the same time, I simply don't see this deck being a "Worlds" style of deck. It's a build I might take to a League Cup, but counts like 2 Lele and tech cards like PCL don't seem (to me) to have the consistency needed to make it through a large and demanding tournament like Worlds. The difference between 2 and 4 Lele in a deck is a big one. This is an example of a "riskier" deck choice. 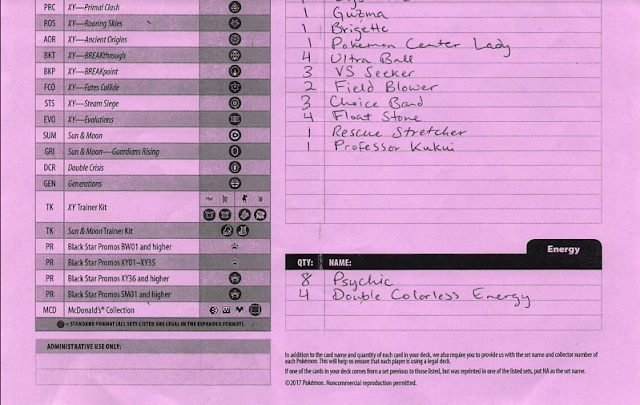 Although the archetype itself was well-defined, this list takes a different approach to gameplay than Jon's winning list, attempting to boost its matchups via techs while sacrificing some consistency. Ultimately, I think Jon Eng's consistency boost is what took him all the way to first place. Where does this leave us in relation to Worlds? Not being a Worlds-caliber player myself, I don't feel qualified to offer advice such as "Espeon/Garb is the play! ", but I am capable of reporting and analyzing data - the most recent of which suggests not simply that Espeon might be a good play, but a broader fact: consistency is king.